Fixed a bug with playing more than one game and "plunge" value not showing. Other minor fixes made. Now tells you when, "only vowels are left". Puzzle Plunge is bigger and better than before. New set, better graphics, more puzzles than the first and Puzzle Plunge 2 has Net Play so you can play with up to 3 friends over the net. You can still play single player or up to 3 people on one computer. 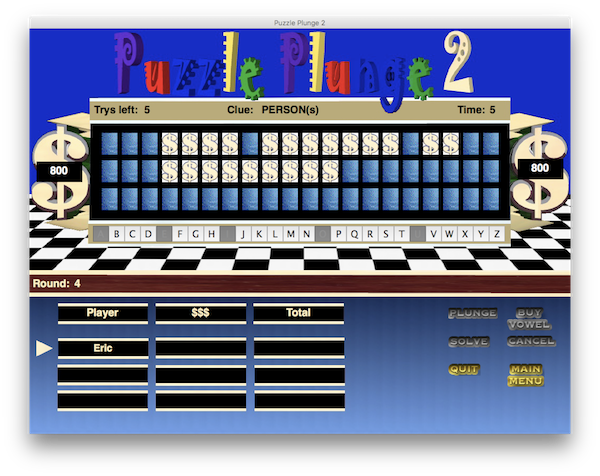 Puzzle Plunge 2 is a puzzle solving game, similar to Wheel of Fortune. Four rounds of game play with a Bonus Round!